Mother's Day is a celebration honouring mothers, motherhood and the influence of mothers in the society. This is a day for many people to show their appreciation towards their mothers. It is celebrated on various days in many parts of the world most commonly on May. Here in the Philippines, Mother's Day is celebrated every 2nd Sunday of May. I still remember when I was pregnant with my eldest 11 years ago, a simple SMS from friends greeting me a Happy Mother's Day brought a smile on my face. It is an extraordinary feeling especially for first time mothers. I am sure some of you were already making plans to make the day special for your mom, wife, or sister. Sharing a meal with her, giving her gifts, or perhaps pamper her by bringing her out for a luxurious bubble bath. Or maybe, if you are already a mother, you are now planning for yourself and just wanted to enjoy your "me" time, or by simply going out with your family. I am sure it will be fun. And like you, I will still be celebrating it with my family. For Mother’s Day 2014, I am taking another step through the “I Love Being a Mom” project. This is a project born out of my earnest desire to give back to society. I’ve always wanted to do something good to society, whether small acts, volunteering or becoming involved in a community. This is one of the many values I learned in College where I used to be active in the Student government. And it feels good to do good. 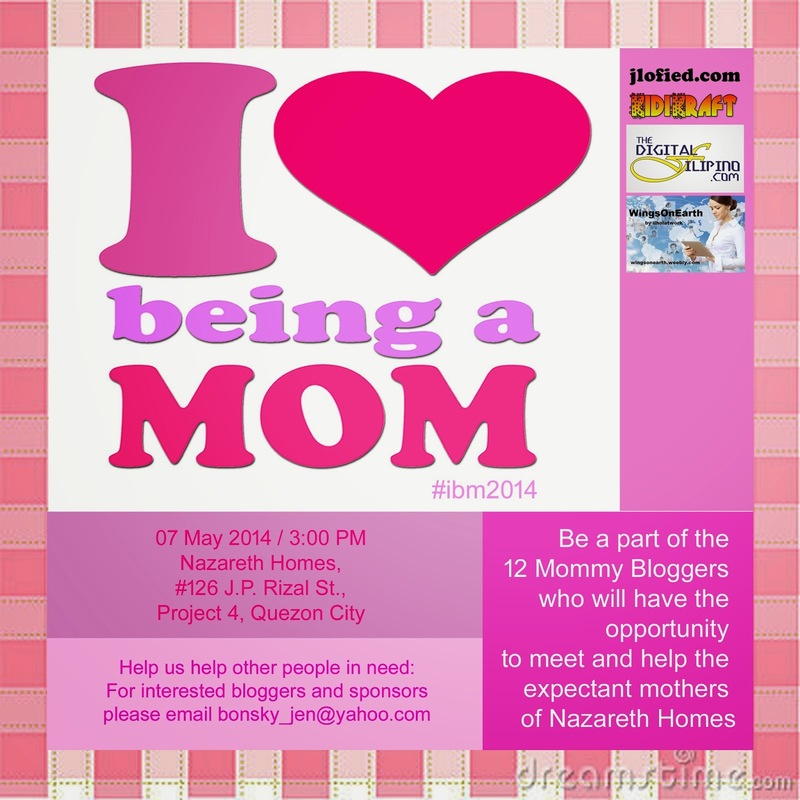 The #ibm2014 will be needing 12 mommy bloggers who will be the Campaign Ambassadors of #ibm2014. If you would like to be a part of this meaningful initiative to help other moms in need, please feel free to email me at bonsky_jen@yahoo.com or share this post to your social network.